i'm finally just getting a few photos up from our little weekend activity! 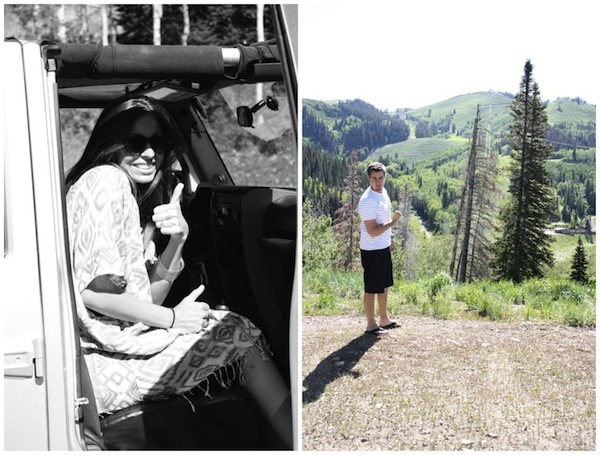 our new favorite thing to do on sunday's after church is take a drive- whether it's up the canyon, a spur of the moment trip to roosevelt, or in this case, we decided to head to park city for the afternoon. hubs had just taken a jeep in on trade (perks of working in the car business- getting random, fun vehicles from time to time) so we decided to cruise with the top down on a beautiful summer day! the second we pulled onto main street i remembered that they do a farmer's market every sunday in pc which apparently they call "park silly sunday", so we did a little wandering and looked at all the fun local jewelry and goodies. it was so fun and we found a few great finds including olive oil and sea salt french bread (amazing!) and a cilantro lime dipping sauce that we've already used in a few of our mexican dishes and tastes absolutely divine! on the way back we went the "back route" and the view was to die for! between a gorgeous drive and great company- i'm loving this summer sunday drive thing and think it will be happening a lot this summer! i hope you all had a great weekend and am already ready for the next one! oh that black dress is super cute with that sweater I have something similar that may now on my packing list for my lakehouse Michigan vacation. I love the idea of just going for a drive after church. How sweet! And I love the kimono over this dress - super cute! How fun! I love spending time with my hubby and having those go-to dates that you can look forward to each week :) If you get a minute, I’d love to know what you think of my latest outfit post!